Looks like we have some more pictures for everyone! 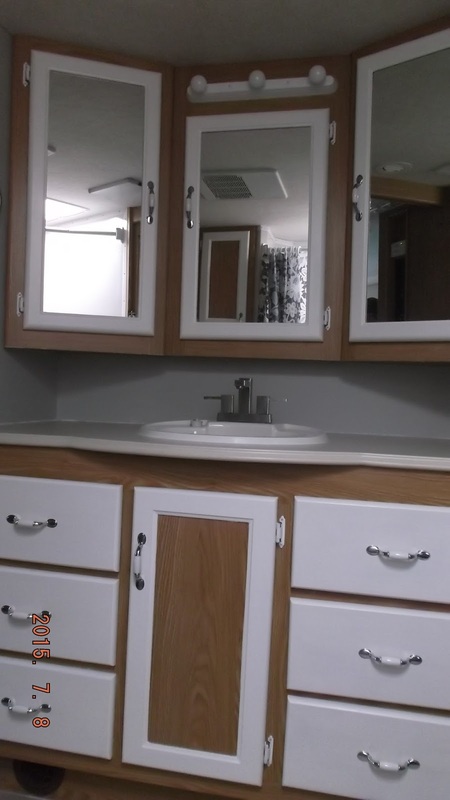 The bathroom cupboards and walls have all been completed, in the RV. Paint used once again was Farrow & Ball, and because the textures of parts of the cupboard doors are not real wood and non paintable, we had to improvise so to speak and do parts of it with paint and leave other parts in it's original covering. But both of us think it turned out quite nicely. The light fixture, originally gold, was scraped right down to hold the spray paint, and spray painted white.We replaced all the handles and hinges that were gold and the hand towel bars as well were switched from gold to a brushed nickel.